Today I bought 100 shares of Fortum Corporation at €14,29. 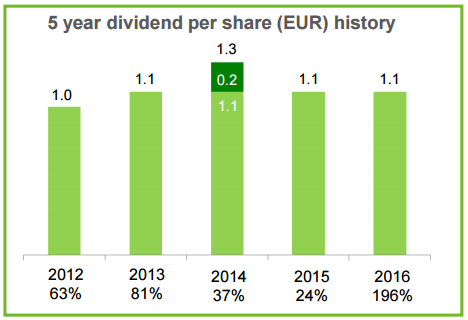 The 2016 dividend was €1,10 so the shares have an initial yield of 7,7%. Based on last years dividend a yearly dividend of €110 is added to the portfolio by this purchase. Fortum Corporation is an energy corporation listed at the Helsinki stock exchange. Fortum is mainly active in the Nordic countries, Russia, Poland and India. Fortum is an energy company getting their income from operating powerplants, the selling of electricity and heat. Also Fortum is providing waste services. If sustainablity is one of the key values you use to build up your portfolio, Fortum is unfortunately not for you. Fortum owns stakes in various nuclear plants in Finland and Sweden. Fortum is also active in Hydro Power and Solar Power, but due investments in nuclear plants Fortum forfeits a place in any portfolio where sustainability is also taken into consideration. The Finnish state has a 50,8% share in Fortum and is considering this a strategic investment to protect key companies from hostile takeovers. So not expect to earn a premium due to a takeover bid. Fortum has as target to have a payout of 50-80% of the earnings per share excluding one-off items. Low energy prices are resulting in presure on the earnings per share, but the cashflow is still high enough to maintain the dividend. Against current energy prices the dividend maybe can’t be maintained, but even a big reduction of the dividend will still result in an dividend yield which I consider acceptable.